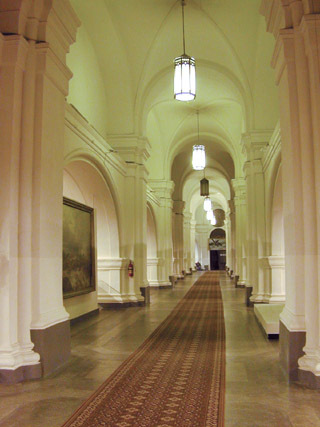 Now we go through the halls that are devoted to the Soviet period. I skipped the Engineers' Hall, but in return devoted quite a lot of attention to the rockets. 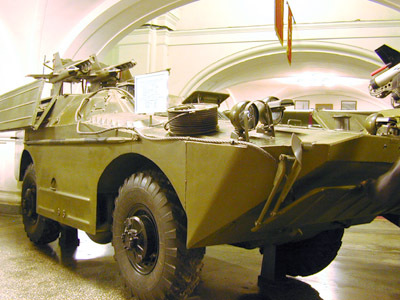 We start with the armoured car that we also saw at the end of the previous album. Here it's shown from the other side, where one sees the inscription "An enemy of capital". This is actually an exhibit from both the pre-revolutionary and the Soviet period, as it witnessed the most important revolutionary action. 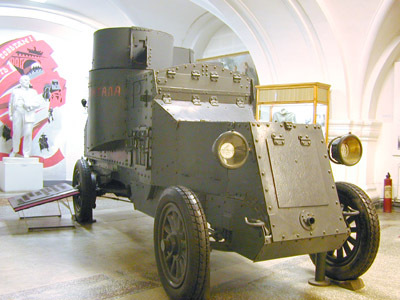 The engine assembled at the Putilov Factory and was called "Austin-50". 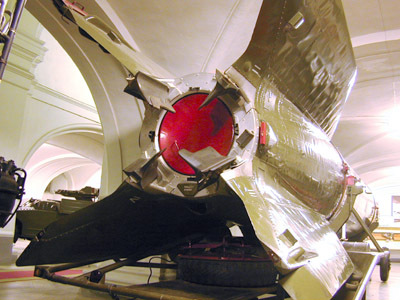 It is equipped with two machine-guns of the "Maksim"-type. 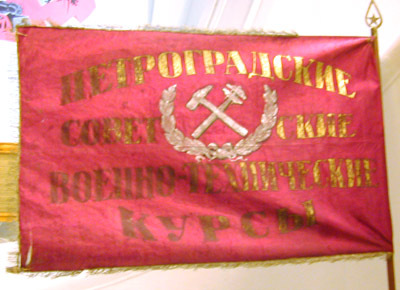 A flag from the 1920s or early 1930s. 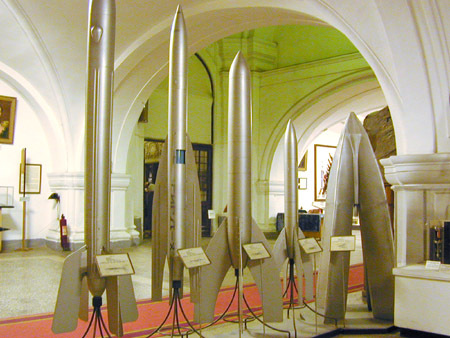 Rockets developed in the USSR by the GIRD group (the Group for Research on Reactive Movement). The group was formed in 1931, and was headed by S.P. Korolev. Afterwards, GIRDs were created in other cities of the USSR, and everyone who wanted to could participate. Only educated specialists were admitted to the industrial GIRD groups. To the extreme right is the rocket 07 (the engine runs on liquid oxygen and kerosene, the tanks are placed in the rocket's stabilisers, and that is why they are this large and displaced at their ends). To the extreme left is the 09 rocket (on liquid oxygen and petrol mixed with rosin). The rocket weighs 19 kilos; its thrust is approximately 37 kilos. All the rockets are experimental: different ideas and fuels were tried out on them. 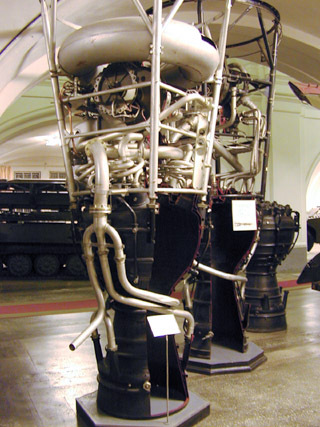 The liquid reactor engine was first tried out in the USSR. The height of flight varied between 0 and a few kilometres. 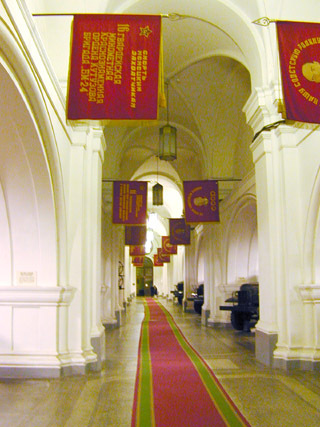 Later, GIRD and GDL (the Leningrad Gas Dynamic Laboratory, about which there is a museum in the Peter and Paul Fortress) were merged into RNII (the Reactive Science Research Institute). A hall about the Great Fatherland War 1941-45. I cannot say in what year shoulder straps like these were introduced. Probably during or after the war. 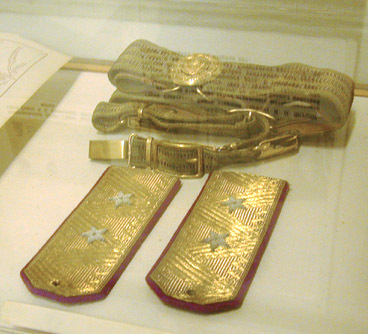 Shoulder straps in general were reintroduced in 1943 (they were abolished after the Revolution in 1917, because of their associations with the soldiers of the Tsar's Army). 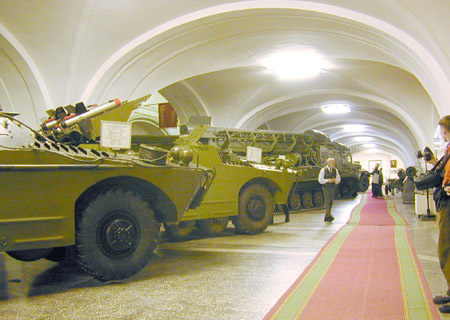 I remark that the reforms haven't really touched upon this museum, and accordingly, they haven't reconsidered the pre-Revolutionary and especially the Soviet period of arms development. Because of this, if you haven't been there yet, I recommend that you visit as soon as possible. 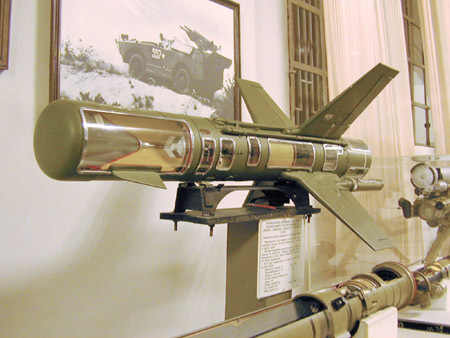 An anti-tank navigational rocket from the rocket complex "the Flute". As far as I understand, it is navigated through the wire one sees at its end. The transparent "windows" are made, of course, to make it easier to inspect. "Launching installation for the 2P4, with the rocket ZR2 from the tactical rocket complex 2K4 "Filin", which was taken into the arms equipment in 1957. Head constructor: N.P. 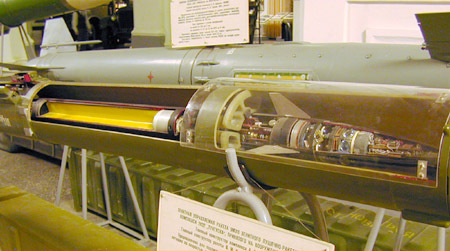 Mazurov, NII-1 GKOT (MIT MOP). Maximum firing range 24.7 kms. 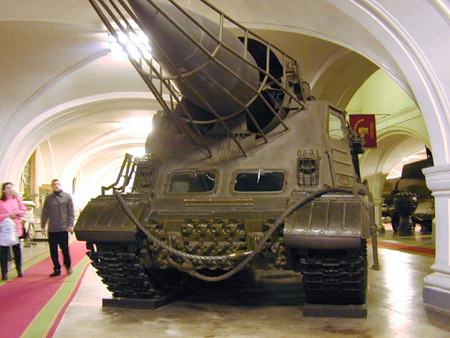 The artillery section of the installation is placed on the base of the self-propelled artillery installation ISU-152K. Maximum speed 42 km/h, with a rocket, 30 km/h. The mass of the launching installation is 40 tonnes. Takes 5 persons. The rocket is a single-step, based on gunpowder, and turns around itself during flight. Calibre (diameter of the body): 61.2 centimetres. Calibre of the nuclear arms section 85.0 centimetres. The start mass of the rocket is 4930 kilos, while the mass of the arms section is 1200 kilos." 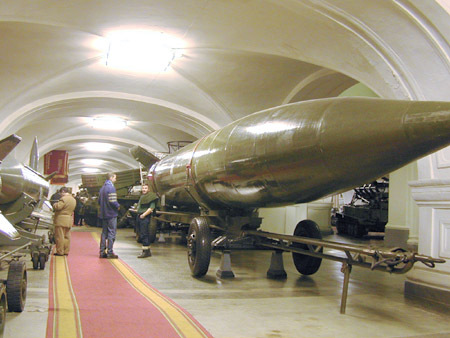 The second model of the national ballistic rocket. Taken into the arms equipment in 1951. Developed in SKB NII-88 under the leadership of the head constructor S.P. Korolev. Compared to the R1 rocket (8A11) it works according to the radio correction principle, which increases the firing precision in the side direction. It has a headpiece that separates after the fuel has burned out, and it carries a fuel tank, and has a range that is more than two times that of the R1." The same rocket, from the nozzle end. One can see the fuel handle bars. Year of entry into arms equipment: 1951. 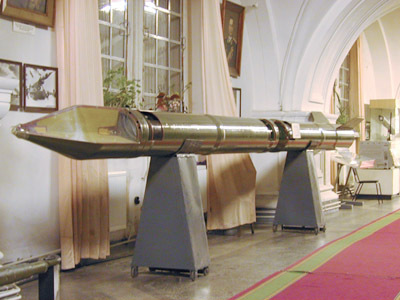 Length of rocket: 17.8 m.
Mass of the inserted rocket: 20.42 tonnes. Mass of the explosive matter: 1908 kg." The fuel is spirits, oxidised with liquid oxygen. Liquid reactor engines from this or a similar rocket. "The anti-aircraft navigational rocket 9M311 from the anti-aircraft cannon-rocket complex "TUNGUSK", taken into the arms equipment range in 1982. Head constructor of the rocket: V.M. Kuznetsov, KBP Minoboronprom. Intended for firing against low-flying items in an aerial attack with a speed of up to 500 m/s. In height: from 0.015 to 3.5 km. In distance: from 2.5 to 8 km. Probability of defeat of one rocket, 0.56 to 0.9. This is a solid fuel, double calibre (76-152 mm), two-step rocket. Rocket mass 42 kg, munitions mass 9 kg. The rocket is launched from the anti-aircraft self-propelled launcher 2C6 with 8 launchers (for 8 rockets). I know that some acquire great pleasure from seeing this picture. The lenses to the left are apparently for the placement system's tellers (on warmth). To the right are micro schemes in cases that were widespread in military equipment during the Soviet period. The round one is an operational booster or amplifier, to the right in a ceramic case (with golden feet :) something clearly digital. Everything is covered in varnish, so that it cannot be destroyed by vibrations. "The anti-aircraft navigational rocket 9M330 from the anti-aircraft complex 9K330 "TOR", which was taken into the arms equipment in 1986. Head constructor of the complex was V.P. Efremov, NIEMI. Head constructor of the rocket was P.D. Grudin, MKB Fakel. 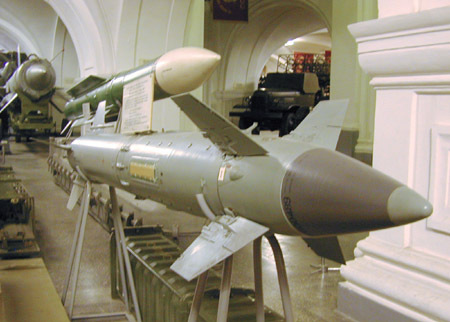 Intended for anti-aircraft defence from attacks with high-precision weapons (VTO), navigational and anti-location rockets, navigational air bombs, airplanes, helicopters, winged rockets, distance piloted flying devices, with a speed of up to 700 m/s. In distance: from 1.5 to 12 km (VTOs up to 6 km). Probability of defeat with one rocket: 0.4 to 0.9. This is a one-step, solid fuel rocket. The rocket's mass is 165 kg, and the munitions part's mass is 15 kg. The rocket is launched from the arms engine 9A330, which takes 8 rockets." With this we conclude our short excursion of the Museum of the Artillery, Engineers and Signallers. I think that at least you have a general idea about this museum by now.